Add the following description to each CALECIM® Professional product. 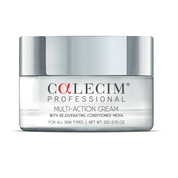 Calecim® Professional Multi-Action Cream provides skin with essential nutrients to visibly rejuvenate skin, revealing youthfulness and radiance in just two weeks. It works on a multitude of skin ageing symptoms, by restoring epidermal cell turn-over to an ideal 28 days. There is observed improvement of skin tone, overall firmness and reduced appearance of fine lines. Application of Multi-Action Cream has also been clinically observed to improve facial definition in the areas of eyes, cheeks and jawline. CALECIM® Professional Serum contains a formulation of essential nutrients derived from cord-lining extract that is clinically observed to improve overall condition of the skin. It is the physician’s aftercare of choice to enhance the effects of in-clinic aesthetic treatments. Upon completion of physician’s prescription of CALECIM® Professional Serum, effects of aesthetic treatments are maintained with daily use of either CALECIM® Professional MultiAction Cream or CALECIM® Professional Restorative Hydration Cream. 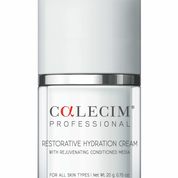 Enriched with naturally occurring hyaluronic acid from powerful CALECIM® rejuvenating conditioned media, CALECIM® Professional Restorative Hydration Cream provides optimal hydrating solution for skin. In a supple, silken texture that absorbs instantly into your skin, Restorative Hydration Cream immediately helps restore its youthful appearance and provides an added glow.